I’m always going on and on about vegan creaminess, so here I go again. Usually creamy texture is brought to us in the form of delicious fatty vehicles like cashews, tahini and avocado. Instead, here is an almost fat-free method that might not pack the decadent punch of a cashew based cream but gets you there all the same. Cauliflower is pureed with a few other veggies and lots of basil until silky smooth. It’s actually a wonderful soup on its own, but bulked up with a pillowy gnocchi, white beans and wilted greens it becomes a meal unto itself. I used Rising Moon Gnocchi (it’s not on their site for some reason) but there are lots of vegan gnocchis out there and if you’ve got Vegan With A Vengeance you can even make your own. I mean, you can use whatever cookbook you’d like to make your own, I’m just saying. And keep this a secret, but the soup base on its own makes a great pasta sauce the next day, even without the basil. So if you don’t have all of these ingredients on hand right this second, definitely keep the cauliflower base in the back of your mind for the next time you’ve got a few florets impatiently starting back at you. Optional: I didn’t add them here, but toasted pine nuts would make a great garnish. Preheat a 4 quart stock pot over medium heat. Saute garlic in olive oil for about a minute, being careful not to let it burn. Add cauliflower, 3 cups of broth (alert! only 3 of the cups! you’ll be adding the last cup in a bit), salt, thyme and several dashes fresh black pepper. Cover pot and bring to a boil, stirring every now and again for about 10 minutes, or until cauliflower is tender. Vigorously mix together the final cup of broth and the arrowroot until dissolved. Lower heat a bit so that the soup is at a slow boil. Mix in the broth/arrowroot and cook uncovered for another 5 minutes until slightly thickened. stirring often. Add the basil leaves, and remove from heat. Use a submersion blender to puree until smooth*. Taste for salt and seasoning. Return to the stove over medium heat and add the gnocchi, cover and let cook for 3 minutes or so. Add the greens and beans and cook until greens are completely wilted and beans are heated through, about 5 more minutes. Be careful as you stir not to crush the gnocchi or beans. Serve garnished with extra basil and pine nuts, if you like. *If you don’t have a submersion blender (GET ONE!) then use a blender or food processor to puree in batches, being careful to lift the lid once in awhile so that the steam doesn’t build up and explode. I love coming across a recipe and realizing I have everything already in the house, waiting to fulfill its dinner destiny. There is no better feeling! Note to self: No, it isn’t soup season anymore, but I am all over this, regardless. And I’ve always wanted to make gnocchi! I will have to wing it as my copy of Vegan with a Vengeance hasn’t been delivered to me yet by the Gods of Amazon. This looks delicious, I’m going to try it out tonight! This looks delish! Lucky for me, just say the word pesto and the kids are all over it. this is going on the menu ASAP. This looks very delicious and actually quite summery as it has basil in it! I made a creamy soup with cauliflower and navy beans as the base the other day and it was so creamy. Blending in some basil will be happening the next time I make it! Some roasted grape tomatoes on top would also be a lovely addition. Wellll I made a change – pureed the beans into the soup instead of thickening with arrowroot. And used a 16 oz package of shelf-stable gnocchi. This was good but next time I think I would blend the greens into the soup too, I wasn’t appreciative of the difference in texture between the greens, the thick soup, and the gnocchi. Toasted pine nuts on top are a must, btw, oh man. Dang this looks good! pine nuts on top sound amazing! I don’t have an immersion blender (it’s on my list), so my way of dealing with hot soup is with my regular blender which has a lid that has a removable center (I think this is pretty standard, there’s a clear plastic thing that pops out). I take out the middle part, and hover a bowl that’s about the same size as the lid over the top to catch any splatter that might come out. That way, the steam can escape. I’ve exploded blenders waay to many times trying to use the occasional lift method. 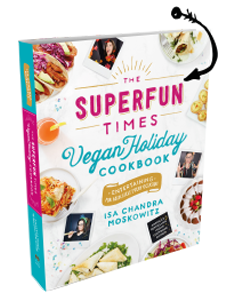 My two favourite cookbooks: VWAV and Veganomicon and my two favourite chefs? Isa and Terry! We love to make soup for lunch over this side of the pond (UK) and I just know my other half will love this – beans, greens and soup! What more is there to ask for! Thanks for your infectious enthusiasm and freakin fantastic recipes. this soup is delicious and perfect for our rainy weather! swiss chard has got to be one of my favorite greens, and it seems like i always end up blending them! i’m on a huge soup kick, so this is appreciated. i’m really glad that this is a nut-free “pesto”. Isa, I loved this. My husband and I just ate this dinner two nights in a row. To anyone out there that wants to go heavy-handed with the gnocchi–don’t. Just follow the directions 🙂 I am absolutely going to revisit this as a sauce for pasta. Delicious! Also loved your Rustic Stew–made that one last week. This is tomorrow’s dinner for sure. I agree with all here, this soup is really good. The very next day I made the same cauliflower broth but used diced potatoes and shitakes for a no-clam chowder of sorts, also awesome. I think tonight I may use the base to do a cream of mushroom. Anyway, this recipe is genius so go make it now! This is delicious. The cauliflower base is sheer brilliance. It made for a super creamy and flavorful broth. What a unique and awesome recipe. Thank you! Gnocchi are my favourite and this soup looks like the best thing in the world. Can’t wait to try it! Just putting the finishing touches to this soup. But I have already tasted it. Yummy! I made this Friday. It was delicious! It did not have an overwhelming sulfurous cauliflower taste, just a gentle sweet cauliflower taste–really smart handling of the cauliflower, better than the old Laurel’s Kitchen recipe. The Rising Moon gnocchi were great with the pesto and the chard stayed nice even on reheating. I think there could be more gnocchi, thats about it! your right…i do need an immersion blender..that was such a pain! but completely worth it! I practically doubled the beans..because we like our protein! and i went easy on the swiss chard so the texture wouldn’t be too varied. i’d like to experiment with different greens in the future with this cauliflower base.. Sundried tomato/ spinach, zucchini ,mushroom anyone?! THANK YOU! I love coming across a recipe and realizing I might some day have everything already in the house, waiting to fulfill its dinner destiny. This recipe speaks to my condition, and I look forward to making it in the near future (when in a place where pre-made gnocchi doesn’t cost $8 for 16 pieces, as it does here in west Africa). Thanks for a simple, tasty, healthy (eloquent) recipe, which anyone could come up with, but we don’t; only you do! Thank goodness for you. Lovely photo, by the way. I made a version of this soup last night, and it is honestly the best soup I’ve ever eaten!!! i had a huge head of cauliflower to get rid of so it was the perfect recipe. i followed the first part of the recipe, and made the soup base. I pureed it in the blender, and meanwhile I sauteed a couple baby red new potatoes in a little olive oil, for about 5 minutes. Once the soup was pureed I dumped it back into a pot and added the potatoes and maybe a cup of corn (some frozen, some canned). I let it boil for another couple minutes, so the potatoes would get a little soft. It turned out wonderfully…like a pesto chowder! So wonderful and thick. Thanks so much for the recipe. That’s the spirit! This is such a good base for experimentation and cooking what you have on hand. I just bought a huge head of cauliflower, planning to make caulipots (again!). I’ve since reevaluated my life and decided that this recipe has won the cauliflower’s favor and shall be created at once! This is amazing, make it now. It’s so easy, I’m not the greatest cook but it came out perfectly. Actually I had run out of olive oil so I used lime infused avocado oil which I was worried wouldn’t work but it still came out amazing. Everybody in the house, even the fussy eater, went back for second helpings. It’s so creamy and so insanely delicious. OMG. I have some butternut squash gnocchi in the freezer that I need to eat. I bet they’d be perfect in this! Lately I feel like I’m rediscovering cauliflower just like I rediscovered cashews a couple of years ago. It’s seriously awesome how versatile that vegetable is. Looks absolutely superb! What a wonderful mix of hearty texture and light spring flavors. My.non vegan husband adored this soup. Though he did add cheese. I used fresh borlotti (pink) beans as they are in season here in Australia. I love the thickness the blended cauliflower adds with all of it’s cruciferous goodness. Well done Isa you’re my new favorite cook. I love gnocci, and I love pesto! What a great idea for a soup. I often make pesto with kale instead of basil. Do you think it would compliment the flavors you have going on? I will definitely be trying this. This soup is AMAZING. My blender was breaking in the process but I held it together with masking tape, paper towels and brute force so that I could get the soup smooth enough and finish blending. Completely worth the effort, however now I need to get a new blender (Submersion blender maybe? 😛 ) so that I can make it again! This soup is filling, delicious and absolutely perfect especially if you love pesto. Lunch Options: National Vegetarian Week « Leslie the Running Chasqui! This was a great recipe with homemade sweet potato gnocchi. If you’ve never made gnocchi before, I was surprised by how easy and inexpensive it is to make! Amazing soup! I’ll use any and every excuse to eat gnocchi, thanks for yet another reason. Is this recipe in one of your books? I’m trying to decide which one to get next (I have, and adore, VCTOTW) and am having a tough time deciding. I just made this soup and it was fantastic! I absolutely love your site – I have been trying to find vegan recipes that appeal to my (carnivore) husband as well, and my lord I think I’ve found it! I made your potato salad on the weekend and it was a huge hit. Thanks for making going vegan that much easier! I’ve fallen….. in love with this recipe as well as your site!!!! So glad I came across it :)! This is sooooo good. But please don’t discard your chard stems. Saute them with some more garlic and olive oil and then cook covered with a little water for a few minutes. Made this last night and it was a big hit with the whole family! Just delicious – and really easy too! I don’t know if it was my immersion blender or my skills – but I had to put some of the soup with the basil in a blender to actually get the basil blended. But it was worth the effort and the extra dishes! I just made this soup for the first time today it turned out so well! I love love love love it! Thanks for sharing – I posted it to my FB page as well. Feel free to check it out. Does this make enough for dinner for two? Made this for lunch for my omni grandmother and vegan roommate. We all loved it and I will definitely be making this one again! I added a parsnip for blending instead of arrowroot and used whole grain twisty pasta instead of gnocchi….so good iys almost gone! What is the texture on this supposed to be like? It seemed really thick! It should be a thick soup, but definitely not thick like a pure puree. This was amazing. My husband devoured it (3 helpings!). Thanks so much. Holy crap! This was so dang good! Made this for an extended family formal dinner, and WOW. This soup is SUPERB! C’est magnifique! We made the recipe exactly, but doubled it, and it turned out to be so delicious, we happily had it for lunch the next day. Served it with your olive oil bread baked with rosemary. Nothing like crusty rosemary olive oil bread to dip in this soup. This is the soup for dipping of all soups for dipping! And we made the gnocchi homemade from Vegan with a Vengeance! Thanks for making it possible to try my hand at so many new culinary experiences! I’m excited to cook up the rest of the gnocchi, which are now floured and in the freezer at your recommendation. Thank you again Isa, for another wonderful dinner chez nous! But I dont see any other veggies in the base? You’re right! Did I mean that garlic was a veggie? Did I just say the wrong thing? Did I just mean “ingredients?” We will never know. My roommate and I just made this and it is AMAZING! We used the cauliflower and collard greens (instead of chard) from our CSA, and used homemade butternut squash gnocchi. It is 10:15 at night, and it took me all day to make (making the gnocchi took a while), but we both want to just sit here and eat and eat and eat the whole pot of soup. Also, Isa, my roommate and I have taken to calling you “The Magic Cookbook Lady,” because every single recipe of yours that we have made is perfect – no matter how much we change it or screw it up. This recipe cements that magic status. So, so, wonderful. Thanks, I’ll take that title! This soup rocks. It was dinner tonight. Thanks for sharing this, you rock ISA!!! This soup is so delicious and easy to make! I have to say my submersion blender was the best $30 I’ve spent. It saves so much time and mess! Wow, this is so easy to make, uses one pot, and is superduperdelicious! used vegan pesto that has been in the freezer since last summer and its the perfect springtime meal! i’m not telling my husband there is cauliflower! i actually used that light green one that looks like fractals. thank you! This is awesome! Any chance you’ve got the nutritional info handy, or a guide to what I can add to my “food tracker”? I love that this info is available in all the AFR recipes since I’ve been living off that book for over a year now and never felt better. Keep up the good work! A follow-up comment for anyone else tracking their food – I used SparkPeople.com to work out the nutritional info based on the ingredients I used, and it works out to approx. 260 cal, 3.5 g fat, 47 carbs, 10 g fibre and 13 g protein per serving. I just made this and It was awesome! i think i will blend the swiss chard in next time and maybe throw a bunch in to give texture. HOWEVER, i made the mistake of putting too much liquid in the food processor…. explosion in my kitchen. but no worries, soup was salvaged. Almonds on top would be ever better then pine nuts. I just made this and it is DELICIOUS!!!! So creamy and easy to make. I used a pretty large bunch of swiss chard which turned out great. I think one could use a whole 16 oz. package of gnocchi. i added nooch, subbed arrowroot with tapioca flour (like your baking books say) swiss chard with kale and navy beans with chickpeas. it was really perfect for a rainy irish day like today. thank you. I made this for my omni beau this past weekend; I had one bowl, and he ate literally the rest of the pot. I’m so glad I bought enough to make two batches! Also since he had a bike tour I bought (I know, I know, not as good as homemade but) tofurkey italian sausages to mix in his bowl. IT WAS INCREDIBLE. Thanks Isa you’re the best! I have it finishing up on the stove right now! Instead of arrowroot I added an avocado for creaminess before blending the cauliflower, and used kale instead of swiss chard. So far, its amazing!! Can’t wait to have a big bowl-full! Thanks! I made this for lunch this week. It was quick and easy to make. It was so cool how creamy it turned out. I used the cornstarch option. It was what I had in my pantry. Thank you for sharing all of these amazing recipes! I didnt have Swiss chard so I used Napa cabbage, no navy beans eith so limas had to do. Still a super easy and yummy recipe, this ones a keeper. Thanks for your great recipes! The comeback meal « What's French Cooking Without the Butter? Ouahh!! I think this is the best soup I ever made. Thank you so much!!! Yeah, you need more than 4 cups of broth – anyone else find that? It is a wonderful delight when delicious flavor comes together with Healthy Eating! I’m not a vegan. I’m not even a vegetarian(i’m a deserter). This soup was awesome. I’m making it for everyone asap. This looks amazing! Is there a submersion blender that you would recommend? 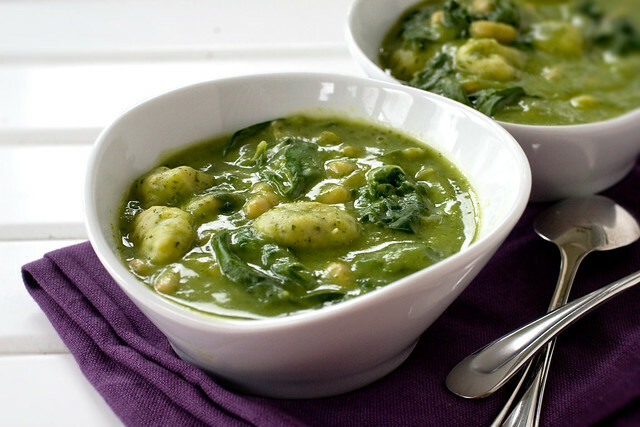 Pesto Soup with Gnocci, Beans, and Greens | food and stuff. I’ve cooked a great many internet recipes, and I gotta say, this is one of the most delicious things I’ve ever tasted. Delicious! We have three vegans, one vegetarian, one mostly veg, and one carnivore in our house. Everyone just loved this soup! Thanks so much for posting. ok but doesn’t gnocchi contain egg normally? This was AMAZING! I am all about basil in the summer (and generally cooking in season) and this was a perfect meal with some good wine. I am all about using simple ingredients (because I am a broke student) and am able to make gourmet meals thanks to this website! Hi! I made this last night for dinner and my other half and I LOVED IT. Mine didn’t look vibrant green like yours though and was pretty thick. Any ideas what I may have done incorrectly? I tried to follow the recipe exactly! Thank you for sharing! I’m not sure! In any case though, you can easily thin your broth out with a little veg broth or water. This soup is delicious!! I made it for dinner tonight and everyone loved it. Admittedly, I licked the bowl clean with my finger. Late in the game, but jesus christ, this is probably one of the best soups I have ever had. Just cooked and ate this recipe with my son. We toasted some pine nuts for the topping and I used a purple cauliflower so the dish turned out lilac! yummee! Ooh, lilac soup sounds fun! I tried this over the summer and it was fantastic. Thank you for teaching me the myriad uses for pesto. It’s one of my favorite things but I only ever put it on pasta. I feel like Dumbledore revealed to me the twelve uses of dragon’s blood, but with basil. Made this last night and it was PERFECT. Completely perfect. I didn’t have greens to add at the last – an unheard of event in this household, but it was still super delicious and creamy and good. I make tons of homemade pesto and freeze it every summer with a basil/arugula/spinach/kale blend of greens from my garden and now I have yet one more use for my stash of frozen pesto. Pesto soup, who knew? I’m thinking about doing homemade gnocchi next time if I have the time, because it ‘s super-simple (and storebought is sometimes out of my budget) I just happened to have some on hand this time though and it was an awesome use for it. I’m already thinking of variations… adding carrots or spring peas or leeks or…. Hi there, this weekend is fastidious in support of me, for the reason that this moment i am reading this great educational paragraph here at my home. I am truly thankful to the owner of this website who has shared this enormous article at here. This is my favorite soup recipe. I make it all the time, and variations of it. Right now I have a pot on the stove that used frozen cubed basil instead of fresh basil and diced potatoes instead of gnocchi. Still so good! Love, love love this soup! Cauliflower puree as a base for a cream soup is sheer brilliance! So smooth, so silky, never grainy like a potato puree. I will just say I like my greens cooked more than 5 minutes, unless it’s the really delicate ones like spinach. I’m not a big chard fan, so I did it with kale, and to make sure the kale would be cooked to my liking without overcooking the soup, I pre-steamed the kale for 15-20 minutes. I’ll right away grab your rss as I can’t to find your email subscription link or e-newsletter service. made this last night, it was delicious. Even though it is not soup weather it was liked by all the fam! What would you recommend cutting out if you wanted to use premade pesto instead of basil/other raw ingredients? I made this for lunch today, it’s delicious!! Thanks for the recipe. The creamy/basil/gnocchi combo is fantastic! I substituted the swiss chard for kale, and would recommend steaming it before adding it to the soup if you like a softer texture. this web site, and I used to pay a quick visit this webpage daily. Omg, what a wonderful soup! Creamy, but light, delicately seasoned with basil. I used cannellini beans as I did not have the navy beans. I will be making this recipe again and again! THanks so much!! This soup is awesome!! I made my own gnocci for the first time ( I ate it for 3 days!!) I made your pesto soup from one of your other recipe books but the gnocci and chickpeas make it really filling. Next soup to try is your neep and split pea! I am loving your new book. THIS was YUMMY on a cool spring day, and produce shop had orange cauliflower, so it was a very pleasing color. SO GOOD to gain creaminess from the puree, not fat. Served with toasted pine nuts, really nice, & even my husband really liked this one. Leftovers especially nice, thicker. I made this for my study group tonight and everyone LOVED it! I think this got the best response of almost anything I’ve made for them in the past 4 years. Definitely recommend it! Amazing, thanks Isa. Certainly delivers on the creaminess. Could be my new favorite soup! My “Isa Does It”, “Vegan Brunch” and 20+ years worth of recipes disappeared somewhere from point A to point B. Long story, but my family is sick of me complaining about it. After making this, plus another dozen or so killer recipes from Isa Does It, I wanted to make it again. The first time, I didn’t let the cauliflower roast long enough and the result was a soup that didn’t blend well enough. The second time, I roasted it for much longer and it was perfect. Rockin’. So incredibly good. And I’m an omnivore. I’m an omni who is stretching her taste buds and is grateful to have found this recipe again here. Pesto Gnocchi…it’s what’s for dinner! I made this tonight and it was so delicious. I changed a couple things but pretty much stuck with the recipe. I used 16oz of gnocchi instead of 8 and I used an extra cup of veggie broth at the end to make the base a little thinner and I used a LARGE cauliflower head instead of a small one. Thanks for the recipe, I will have to make this again. This is SO GOOD! I didn’t have any pine nuts, but agree they would be a great addition. I am truly grateful to the holder of this web site who has shared this wonderful article at at this time. It will always be useful to read through content from other writers and use a little something from their web sites. I acquire in fact loved account your blog posts. Any way I’ll be subscribing to your feeds or even I success you get right of entry to constantly fast. Wow this was very good!!! I followed the recipe exactly but 12 oz of gluten free gnocchi (Caesars brand) kudos to reviewer “Sarah” who says to sauté the extra chard stems in garlic n olive oil then add some water and cover to cook. I did just that! I’ve never eaten them before and had a beet-like taste. Delish. Thank you Isa for making my vegan (gluten-free-ish) life worth living once again. This soup is the best, everyone in our household loves it. We blend the swiss chard into the soup so our kiddo eats it up! Geesh, that’s a good looking soup. would sure like to have some for dinner tonight. My daughter loves this soup especially when she isn’t feeling well. I made this recipe when I first bought this book when it came out and, now that items verifiably winter, it’s time for soup-making in the kitchen, so I stocked up on the indgredients to make this soup last night. I completely forgot that I didn’t have a blender. I minced the cauliflower and basil and the soup turned out AMAZING! It was still thick, but slightly chunky and not creamy, but just as good! This article really hit me up. What’s an excellent piece of information. Please keep up the good work. This was an excellent recipe! I love this soup and base, I will definitely be experimenting with it! Totally amazing how creamy it gets! Thank you so much for sharing!